Looking for things to do in Tenterden on your days out in Kent while staying at Yorke Lodge B&B? Tenterden is approximately 27 miles by car from Yorke Lodge Bed and Breakfast. The journey takes around 50 minutes via the A28. There are a number of car parks in Tenterden, details of which are at the end. There is no rail link from Canterbury. So if you’re looking for things to do on days out in Kent look no further! The lovely Kentish Town of Tenterden has much to offer. Known as “The Jewel of the Weald,” Tenterden’s history has been shaped by its location. In the Middle Ages sheep grazed on rich marshland pastures. Thus Tenterden flourished in the 14th Century. Both as a nationally important wool trading and also weaving centre. Crucially it had access to the sea via the River Rother. In 1449 Tenterden joined the Cinque Ports Confederation. Nearby Rye, one of the original Cinque Ports, was unable to fulfil its obligations. Tenterden therefore became a limb of Rye. In return for supplying ships and men to the crown it was granted a Charter. Issued by Henry VI the Charter bestowed legal privileges on Tenterden. Including exemption from customs and taxation! Tenterden’s ability to easily transport goods by sea brought prosperity to the town. It also further enhanced its prominence. But great storms wrought devastation over the centuries. And by the 18th Century the Rother had silted up. In addition much of the rich marshland pasture had once been under water. Drainage projects had been underway since at least 1305. This is when Edward I paid a visit to Tenterden to inspect some drainage works. The combined result of storms and drainage cut Tenterden off from the sea. The town therefore declined in national importance. But ever resourceful, Tenterden harnessed its farming heritage. Reinventing itself in the 19th Century as a market town. By then Tenterden was ten miles inland. Nearby Small Hythe was once a thriving port on the River Rother. And it was thanks to this port that Tenterden prospered. So throughout the 15th and 16th Centuries Small Hythe was an important maritime centre. It had quays and a tidal dock where ships moored to be unloaded and loaded. Tenterden and Small Hythe were also the country’s most important shipbuilding centre. The Wealden forest was an abundant source of timber. At least three kings of England visited the shipyards. Henry V’s ship “Jesus” was built here in the early 15th Century. In 1487 Henry VII came to oversee the building of his ship “The Regent”. While Henry VIII’s visit to Tenterden in 1545 probably coincided with a trip to Small Hythe. This is where his ship “The Grand Mistress” was under construction. 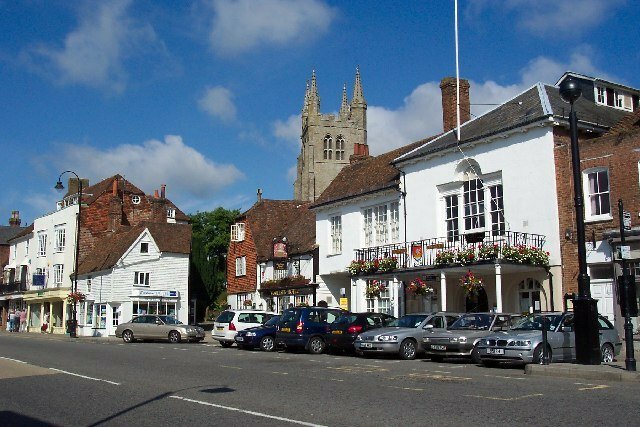 There follows a list of things to do in Tenterden and also in the surrounding area. Including no less than three of the “Seven Wonders of the Weald”. There is also a Heritage Trail leaflet to download and print off on the website. The Trail takes you around the centre of this picturesque town. It gives information for all the landmarks you will see. You can take the trail at your own pace. There are lots of cafes and eateries where you may wish to take a break! Also lots of shops, both traditional and more quirky, along the length of the tree-lined High Street. Some of what follows forms part of the trail. The railway opened in 1900 and the station was built in 1903. Running through the Rother Valley the line provided a passenger link to London via Headcorn. It was also used to transport agricultural produce and livestock. It proved commercially unviable and was closed in 1954. However, in the true spirit of Tenterden it has been restored as a branch line attraction! It is said to be the “country’s finest example of a rural light railway”. Today steam trains take passengers on a nostalgic journey from Tenterden to Bodiam. The station is on the Heritage Trail. The railway is also one of the “Seven Wonders of the Weald”. For a full timetable of services and events get on board on KESR’s website. Stand clear of the doors please! Throughout the second half of the 19th Century plans for a railway through Tenterden had faltered. Finally, in 1896, Holman Fred Stephens was appointed as the engineer for a light railway. This was a cheap way of constructing railways in rural areas. Colonel Stephens kept the project on track and the railway opened in 1900. For full details of the museum visit their website. St Michael and All Angels Church is built of Kentish ragstone and Bath stone. It was constructed by local tradesman from nearby Woodchurch. The local area was known as Boresisle which literally means Bird’s Isle. It is now called St Michaels after the church which was consecrated in 1863. St Michaels has a distinctive tower. It is in the northern part of Tenterden on the A28. TN30 6PU. St Mildred’s Church is on Church Road, Tenterden TN30 6AT. The church was built in the 13th and 14th Centuries. It is therefore much older than St Michael and All Angels. St Mildred’s has an impressive tower. The arrival of the Spanish Armada was spotted from here. And a beacon was lit to warn of its approach. The church also has links to Horatio Nelson. His daughter, Horatia, was married to the vicar of St Mildred’s, Philip Ward. St Mildred’s is on the Heritage Trail. St John the Baptist is the third of Tenterden’s churches. It is at Small Hythe and is a Tudor Church. Completed in 1517 it was built to replace a chapel that had been destroyed by fire in 1514. The church is interesting because in 1509 it was granted the privilege of electing its own priest. It was the only one in the country allowed to do so. The custom continued for 400 years. There are many other churches in the Tenterden area. These include Catholic, Unitarian, Baptist and Methodist. For a full list and further details click here. A veritable hive of activities! Tenterden Leisure Centre has a large swimming pool, gym, health suite and sports hall. Whether a member or not you are assured a warm welcome. There’s loads of stuff for kids, fitness fanatics or just good old fashioned fun! Go to www.tenterdenleisure.com for further information. Parking is available. The Town Hall itself is not normally open to the public. Except the Tourist Information Office! Its prominent position on the High Street also means you can’t miss it! The Town Hall was built in 1790. The previous one having burnt down in 1661. There is a Georgian Assembly Room on the first floor. Here are displayed the names of all the Bailiffs and Mayors of Tenterden since 1449. In 1600 Queen Elizabeth I renewed the town’s Charter. This incorporated the right of Tenterden to elect a mayor instead of a bailiff. It also included the right to attend the Coronation. It maintains these rights to this day. In 1999 Tenterden celebrated 550 years of the Charter. The Town Hall forms part of the Heritage Trail. There are many places to eat and drink in Tenterden. But the Woolpack is worth a special mention. It was originally a 15th Century coaching house. There is an archway under which coaches and horses would have arrived. Bishops and archbishops stayed at the Woolpack. This was for when they were conducting Confirmation services in Tenterden’s churches. Today it’s a cosy country pub serving good food. The surrounding area has many attractions too. So we now move out of Tenterden. 10. Kino Digital Cinema, Victoria Hall, Rye Road, Hawkhurst TN18 4ET – Tel: 01580 754321 for tickets and enquiries — about 10.5 miles west of Tenterden, approx 25 minutes by car. From Yorke Lodge it’s an hour’s journey of around 36 miles. 11. Smallhythe Place, Small Hythe TN30 7NG – Tel: 01580 762334 – about 2.5 miles south of Tenterden, 5 minutes by car via B2082. From Yorke Lodge it’s about 30 miles which takes roughly an hour by car. Smallhythe Place is a 16th Century house now owned by the National Trust. In 1899 it was bought by the Victorian actress Ellen Terry. After the actress’s death her daughter, Edith Craig, turned the house into a museum. The collection comprises personal and theatrical memorabilia. It charts the unconventional private life and remarkable public career of this legendary actress. Ellen Terry’s funeral was held at nearby Tudor church of St John the Baptist. (See Tenterden’s churches above). 12. Chapel Down Winery, Tenterden Vineyard, Small Hythe TN30 7NG – Tel: 01580 766111 – about 2.5 miles south of Tenterden, 5 minutes by car via B2082. From Yorke Lodge it’s about 30 miles which takes roughly an hour by car. Not far at all from Smallhythe Place is Chapel Down Winery. This is the largest wine producer in England. It has won many awards for its still and sparkling wines. These can be purchased at their on-site wine & fine food store. Also available are cheeses, smoked meats and fish. As well as handmade chocolates and cakes. Guided tours of the winery can be booked from April-October. You will see everything from the grapes to the bottling process. But you can also simply wander through the vines following the vineyard trail map. 13. Hole Park Gardens, Hole Park Estate, Rolvenden TN17 4JA – Tel: 01580 241344 about 4 miles west of Tenterden approximately 10 minutes by car. From Yorke Lodge it’s about 33 miles, which is approximately an hour’s journey by car. 14. Rare Breeds Centre, Highlands Farm, Woodchurch TN26 3RJ – Tel: 01233 861493 – about 5.5 miles west of Tenterden, approximately 12 minutes by car. From Yorke Lodge it’s about 25 miles which takes around 50 minutes by car of 25. Set in 120 acres of glorious Kentish countryside there’s so much to do and see here! And its not just friendly animals. There are woodland assault courses and woodland walks. As well as indoor and outdoor play areas. And don’t miss the Butterfly Tunnel from mid-May to October. You can also watch breathtaking Falconry displays. Seasonal lambing and even a “Piggy Grand National” prove there’s something here for everyone! 15. The Reindeer Centre, Capralama Farm, Bethersden, Ashford TN26 3EQ – Tel: 01233 820545 – about 7.5 miles north of Tenterden, approximately 16 minutes by car. From Yorke Lodge it’s about 23 miles which takes around 37 minutes by car. It turns out a reindeer is not just for Christmas! That said these lucky reindeer have lots of other furry friends. Including goats, meerkats, rabbits and llamas. Not to mention ducks, an owl and reptiles. Most of the reindeer have been bred at the farm. From an original herd of 15 Swedish reindeer there are now over a hundred. There’s also a pirate ship and play areas for younger visitors. Now owned and run by the National Trust. But originally created by Vita Sackville West and her husband Sir Harold Nicholson in the 1930s. They were passionate gardeners. From the White Garden to the Sunset Garden. There is a series of small gardens providing ever-changing seasonal colour. 17. Biddenden Vineyards, Gribble Bridge Lane, Biddenden TN27 8DF – Tel: 01580 291726 – about 4 miles north west of Tenterden, approximately 10 minutes by car. From Yorke Lodge it’s about 30 miles and takes around 50 minutes by car. This is Kent’s oldest commercial vineyard. It is also one of the “Seven Wonders of the Weald. Free guided tours are available on some Saturdays. Or marked routes will take you on a self-guided stroll through the vines. Then visit the winery where the wine is produced. Tastings are free! These include award winning wines, ciders and juices. Teas and coffees are sold all year. Ice creams can be purchased in the summer! Now let’s briefly return to Tenterden for more things to do in this picturesque town! We promised you car parks! But before travelling please check times and charges at www.ashford.gov.uk then search Tenterden Parking. As you may have gathered Tenterden is in the heart of the Weald. So if you enjoy walking there are marked country trails. As well, of course, as the walks around Tenterden itself. There is also a “park, walk and ride” by steam train option Other nearby activities include horse riding, golf and fishing. For keen cyclists take Cycle Route 18. This links Tenterden with Ashford and Tunbridge Wells. Tenterden has lots of festivals! From “Tentertainment” which is Kent’s biggest summertime music and local food festival. To November’s Bonfire & Fireworks Spectacular. As well as December’s Christmas lights. For food and drink all year round there are tea rooms, coffee shops, pubs and bistros. As well as restaurants offering fine dining. So you see for things to do in Tenterden on your days out in Kent you’ve got plenty of choice! Tenterden is truly The Jewel in the Weald. For other things to do in the Canterbury area, check out our Canterbury page.